cryptonaut-in-exile: The Doctor's Daughter: "Make the foundation of this society a man who never would." 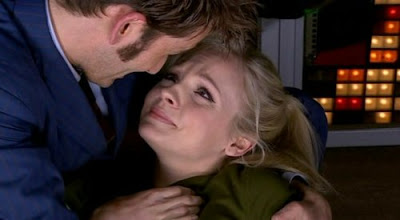 The Doctor's Daughter: "Make the foundation of this society a man who never would." Some ideas just smell bad. You can't take a character like the Doctor and just whizz bang slap a full grown daughter on him (and then whisk her away to boot) in one episode. The viewer knows they are getting cheated going in because there's no way (no way invented yet, anyways) to accomplish this without cheating the audience. Martha, Jenny, Donna, and the Doctor at the Source. There are things about this episode I like, not the least of which is the Doctor, having just laid his daughter's corpse (unresurrected) down picking up a gun and threatening the man who shot her but immediately explaining he "never would." If it stopped there, it would have been OK, but he takes that moment to turn to the two warring factions and tells them to make that the foundation of their new society; he shows them how to be a man that never would shoot another man. It's a powerful scene and it's exactly right. That moment, for me, redeems the gimmickry of the episode. Tennant, like Tom Baker before him, has a charisma that simply never fails, even in the service of a suspect story, he brings the intensity and the levity as they are needed. Here's the ongoing problem, this episode can only lose value over time as Jenny (resurrected) doesn't come back. She's gone off to have adventures, unbeknownst to her father, and the longer we go without him knowing it, or seeing any indication of what she's getting up to, the more it cheapens episode in retrospect. All that, just to throw the character away. Bah. Jenny, we hardly knew ye. You came back and we still don't what you're up to. If it were up to me to fix the episode, there are two ways I might go about it: first and preferred method, I'd have gotten rid of the Jenny character and ordered the scriptwriter to give the Doctor a character to befriend, one that looked like a possible companion in the making, and have that character be the sacrificial lamb at the end; alternately, I would have insisted the Doctor learn either at the end of the episode that Jenny, his female clone, survived after all, or at least learned later when the character was brought back in a future episode. The latter, of course, can still be done. And it should be. The longer that thread dangles, the more it recedes into hazy memory until its baked in as inexcusable sloppiness on the part of the show-runner. Oh, and too much Christian allegory noodling ... an immaculate conception, the deity/Doctor's child dies and in so doing saves the peace of the world, then is resurrected ... gimme a break. Corny.